NEW YORK (CNS) — “You ain’t nothin’ but a hound dog,” Elvis Presley famously crooned six decades ago. That pretty well describes “Rock Dog” (Summit Premiere), a feeble animated comedy about a canine with unlikely musical aspirations. On Snow Mountain, high in the Himalayas, a Tibetan Mastiff named Bodi (voice of Luke Wilson) is stuck in the shadow of his stern father, Khampa (voice of J.K. Simmons). Their two-dog mission is to guard the village from marauding wolves eager to eat the resident sheep population. Bodi prefers playing his guitar to sentry duty. When a passing airplane drops a radio from the sky, it’s like manna from heaven. Turning the dial to a rock ‘n’ roll station (reception is remarkably clear), Bodi is entranced by the music of legendary rock-and-roller Angus Scattergood (voice of Eddie Izzard). The village elder, fittingly named Fleetwood Yak (voice of Sam Elliott), convinces Khampa to let his son leave the village and seek his destiny in the big city. “It’s your life. Make it a happy one,” Fleetwood tells Bodi. And so Bodi hops the bus (mass transit is also surprisingly good), lands in the nearby metropolis — filled with anthropomorphic species — and seeks out Angus’ heavily guarded compound. The aging rocker, a hipster cat with a British accent and a sassy robot butler named Ozzie, invites the awestruck fan into his lair, but his motives are not sincere. Angus needs a new hit, and Bodi’s fresh talent might be just the ticket. Meanwhile, the big bad wolf pack, led by Linnux (voice of Lewis Black), is inspired by Bodi’s departure to mount a final assault on Snow Mountain. Sporting gangster attire and driving stretch limos, these cool dudes have one goal in mind: feasting on grilled lamb chops. 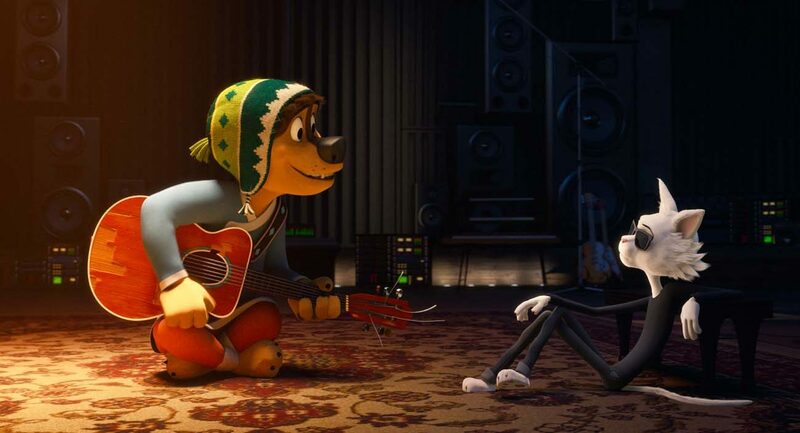 Despite the dangers characters occasionally face and Angus’ mildly intemperate language (he says things like “stupid bloody idiot!”), “Rock Dog” is mindless fare acceptable for all — except possibly the most easily frightened. The film contains a few scenes of peril. The Catholic News Service classification is A-I — general patronage. The Motion Picture Association of America rating is PG — parental guidance suggested. Some material may not be suitable for children.